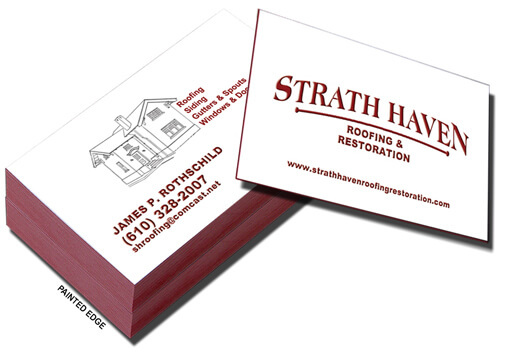 When meeting prospective client, first impressions go a long way, extend a lasting one with an outstanding business card. When it comes to marketing materials, we stand out from our competition by offering many different styles, paper stocks and coatings to choose from. You can order from the prices below or ask for a custom quote, either way you will be happy with the end result. Standard turn time is 3-4 business days. "Brian at Mirror Image worked with me to get the exact look and feel I wanted from my business cards and my T-shirts. I am very happy the results, thanks Brian. " Have our design team create and outstanding design at an affordable price of $75. If you need just type setting for $25. Silk or Soft Touch paper, Suede, Brown Kraft Paper, Luster Cards, Rounded corners, Painted Edges, Akufoil, thermography (raised print), U.V. coating, Spot U.V., Foil Worx, Raised spot U.V. and Plastic Cards. We also offer 18pt. and 32pt. Need a die cut don’t see what you are looking for, just contact us and I am sure we can handle it.